Barratt are reported to be about to start the second half (the west side) of the Dalston Square development this month. Ken Livingstone's London Development Agency obtained permission for the scheme in March 2006 despite community objections and a Hackney report to it's Planning Committee describing the design as "harsh" and "austere". The development - a row of 9 private residential blocks and shops, of up to 20 storeys, with no affordable housing - will be built on The Slab, a massive concrete raft over TfL's Dalston Junction railway cutting. The Slab, costing over £40 million, has been completed. The development includes Transport for London's "transport interchange" which will serve the reinstated East London Line station and the new bus turnaround behind it. The design of the station's entrance is not to everyone's taste . In the depths of the credit freeze there were doubts whether Barratt could proceed. It has sustained eyewatering losses approaching £800 million over 2 years. Like all volume house builders it has been pleading with bankers to relax mortgage restrictions which have been affecting new-build sales and freezing out first time buyers who can't raise the 20% deposits bankers are demanding. With assistance from government bail out schemes, like HomeBuy Direct which helped first time buyers bridge the funding gap, 'Too Big to Fail' Barratt were able to advertise "half-price" deals on some of the Dalston Square flats. Debt-laden Barratt's financial problems have been relieved by favourable conditions for absentee landlords. Recent reports have described how two-thirds of the 5,500 new houses and flats sold in London during the first three quarters of 2009 were purchased as buy-to-let properties. Reports last summer described 'buy to let' marketing of Dalston Square in the far east and the announcements of Phase 1 'selling extremely well' have been talked up by 'massive interest from Far Eastern buyers'. OPEN's concern is the creation of a transient population on shorthold tenancies, which does not create sustainable balanced communities with a commitment to the area. Nearing completion - the east side of Barratt's Dalston Square - a development of 230 flats, shop units and a 3-floor shell for a new public library - is on the Hackney Council demolition site of the former 1886 Dalston Theatre, Georgian listed houses, and what was the oldest circus entrance in the country. The historic buildings were demolished in 2007, despite vigorous community opposition, to create a valuable development site which Hackney Council traded to subsisdise The Slab. A birds eye view of the authorities' 2006 vision for Dalston. In the foreground are the 9 blocks, which are now to be built above the railway cutting, and the ramp for the 80 buses per hour planned to emerge into the traffic of Kingsland Road and head north. More tall storeys. This is the computer graphic used to promote Dalston Square - which some have predicted will be a sunless windswept canyon due to its north/south orientation and the accelerated windspeeds and micro-climates which the tall buildings are predicted to generate. 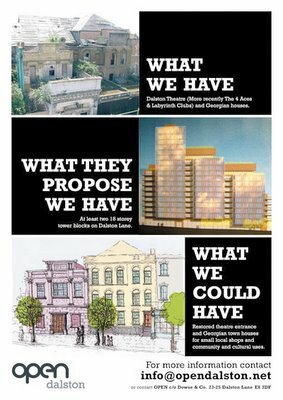 This is the authorities' image of Dalston Square, west side, which is about to be started (with graphic additions by an unknown local artist). But will Dalston Square attract the brand name shops which, the authorities said, the scheme's viability and Dalston's 'regeneration' depended upon? Not, it would seem, while the nation's ghost town high streets are being replicated in Dalston. Dalston Square's completion will be proceeding amidst fears of a 'double dip' recession. Government money for more bail outs is drying up. Even with housebuilders restricting supply to maintain house prices Barratt's own predictions are of a seven year road to a recovery in its fortunes. There will clearly be pressure to downgrade the quality of what is to be built, as some local residents have seen elsewhere. Nearly four years ago OPEN published "Save our past. Save our future". We predicted Dalston Square could become a buy-to-let opportunity for absentee landlords and become the slums of the future. Elsewhere similar schemes have been rejected. Perhaps these battles are what have prompted Barratt's opposition to popular localism policies. But Dalston Square's cheerleader, Hackney's Mayor Pipe, called the critics the "Keep Hackney Crap Brigade". Although Barratt is one of the 'preferred delivery partners' of the Homes and Communities Agency (which finances social housing) a review by the government's design quango CABE had found much of the publicly funded schemes built were unfit for purpose. But which major housebuilders were churning out rabbit hutches during the boom years is a state secret! Now we are bust can we expect the standards of new-build like Dalston Square to be any better?